An earthquake rattled northwestern Illinois and points across the Midwest this morning at about 1:10 a.m. local time, according to the U.S. Geological Survey (USGS). The shallow magnitude-4.5 earthquake struck in a rural area about 75 miles west-southwest of Chicago. People felt the quake hundreds of miles away in Michigan, Indiana, Iowa, Missouri and Wisconsin. "I woke up and felt the house shaking," says Abby Hougan, a Madison, Wis., resident. At first, she says, the rattling sounded like someone was in the house. Later, she learned it was the earthquake. Madison is about 150 miles north of the quake's epicenter. 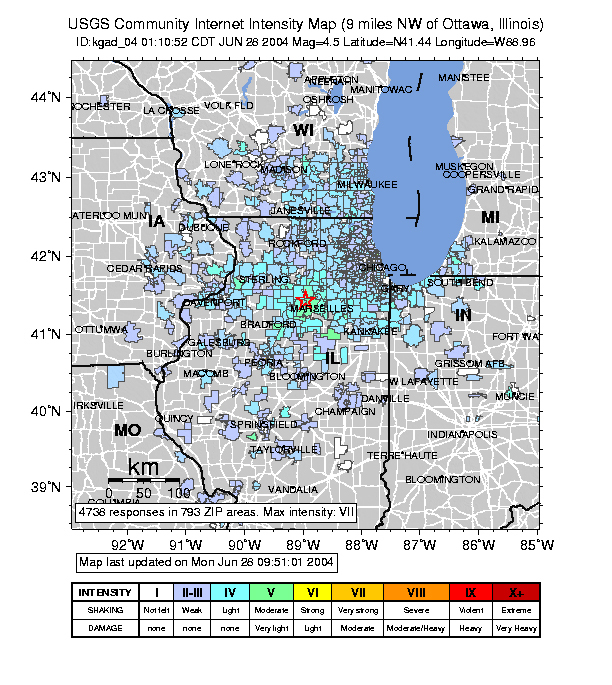 More than 5,000 people across six states have reported that they felt an earthquake that struck northern Illinois just after 1:00 a.m. this morning. The intensity map at right indicates the number of reports and the intensity of the shaking that residents reported on the Did you feel it? Web site. Image courtesy of the U.S. Geological Survey. No damage has been reported and there have been no injuries or related deaths, although police agencies and radio stations within the affected area were inundated with phone calls from residents wondering what had happened, according to an Associated Press report. Seismic activity in northern Illinois and Wisconsin is relatively rare. The last earthquake in this region was in 1999, a magnitude-3.5 quake that also caused no damage. The last quake that caused damage was in 1909; it is estimated to have been about magnitude 5.1, says Tim Larson, head of applied geophysics with the Illinois State Geological Survey. Southern Illinois, however, which is located on the New Madrid fault system, has been more seismically active historically, with a 5.1 quake in 1987. Interestingly, last night's earthquake did not occur on a fault zone, Larson says. The epicenter was near the Peru monocline structure in the LaSalle anticlinorium, he says, which is a series of anticlines, synclines and domes in the area. More than 3,600 miles away, residents in southeast Alaska also awoke to shaking early this morning. A magnitude-6.7 earthquake struck beneath the ocean off the southern end of the Alaska panhandle at about 1:49 a.m. local time, according to USGS. No damages or injuries have been reported. The quake occurred in the Queen Charlotte transform fault system, which had been rocked by a magnitude-8.1 earthquake in 1949.